When Legend’s Wendy won the Missouri Fox Trotting Horse Breed Association’s most prestigious class, the Open Five Years and Older World Grand Championship, she won more than a trophy and a garland. She also won the hearts of many of the people watching that last class of the 2014 Show and Celebration. There’s just something about Legend’s Wendy that is special. Wendy is a calm mare who seems to come alive and get a little “snort” to her in the show ring. She combines this with the gaits of a true champion. Ridden by Steve Dampier, Wendy demonstrated a beautiful walk and a picture-perfect foxtrot. “Wendy’s taking bigger steps. She’s doing the lick we breed these horses for,” said Kilroy. This win isn’t the first time the Kilroys have received a garland with Wendy. Although they didn’t show Wendy in 2013, Larry Kilroy won the Open Amateur Five Years and Older World Grand Championship with Wendy in 2012. 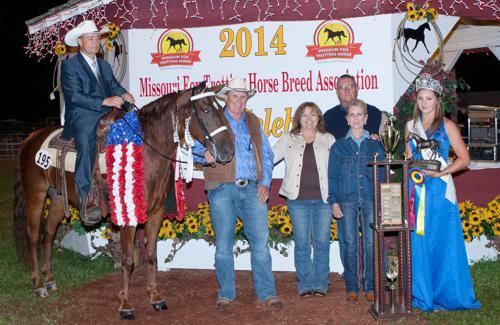 In 2011 Josh Dampier won the Youth 12-14 World Grand Championship with her. In 2010, ridden by then-owner, the late Patty Donley, Wendy won the Amateur Owned Five Years and Older World Grand Championship. “I want to give a special thanks to her trainer/rider Steve Dampier and ground coach Justin Dampier for making this happen,” said Kilroy. “Linda and I were ecstatic about this win.” The Kilroys will continue to show their talented mare in the 2015 season.